Simon Haram played saxophone with the Brunel Ensemble on the Fin De Siècle album. Like Joby Talbot he also studied at the Guildhall School of Music & Drama. Simon has performed for some of Joby’s works, including Aluminium. As a recitalist and ensemble player, he has also performed with the Graham Fitkin Group, the Michael Nyman Band and all the London Orchestras. He has also performed as a soloist for many orchestras. 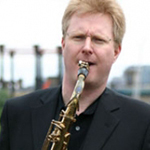 Currently, he is Professor of Saxophone at the Royal Academy of Music. Simon has released a few albums under his name: On Fire (Black Box, 1997), Alone… (1999) and Frame (2001). He also works on recording and production with his own company Silent Age Sound.